The hunt for vitamins: how do I cover my vitamin C requirements? »Bring vitamin C and a good immune system«, answers a friend when I ask her what I can bring to the meeting at the weekend. Although she says this with a twinkle in her eye, there is clearly something behind it. The first winter crises among family and friends are over, but the cold season is still booming. This is reason enough to investigate how one can back up one’s own defences with plenty of citrus vitamin C.
Citrus fruits are everyday companions for me and, in the cold season, my favourite vitamin supplier. I do not really have any special preferences. Freshly squeezed juice for breakfast, half a grapefruit or orange marmalade on a nice piece of bread. I also like clementines. I frequently stroke my fingertips over the shiny peel shortly after leaving the checkout stand. Sort of like an immediate reward for my purchase. Where the fruit hung on the tree is where my finger plunges in and draws the peel slowly away to free the flesh. Fillet after fillet migrates to my mouth until the last piece of fruit has been consumed. Only the hearty bite into lemons – I prefer to leave that to Tequila drinkers. Baked in biscuits or as a hot lemon? Of course! Regardless of which variety or type of food you choose, it won’t only be your taste buds that are excited. My immune system is also very grateful. Vitamin C is one of the most important nutrients for the human body. It strengthens the defences and can shorten the duration and strength of colds. A look at the page of the German Society for Nutrition tells me that adults should be taking 0.1 gram of vitamin C daily. No problem for citrus fans, right? So how much juice do I actually have to drink? How much fruit should I eat? Or is orange marmalade enough? I once investigated this and checked various citrus delights for their vitamin C content. I like the hot lemon moderately sour and add three tablespoons of juice into a cup. In lemon juice, there are about 0.05 grams per 100 millilitres. This means that the daily requirement is covered with 200 millilitres of juice. With four cups over the day I reach my targeted vitamins. In order to not only alleviate cold symptoms, but also to meet vitamin C requirements, it is important that the water is no longer boiling when mixed with the lemon juice. It should only be only 60 degrees so that the vitamins are not destroyed. A freshly squeezed orange juice in the morning drives away grief and sorrow? At least I don’t have to worry about vitamin C deficiency with just one glass daily. A litre of juice has about 0.49 grams of vitamin C. Thus, five large gulps deliver the day’s needs. Grapefruit is also a popular breakfast vitamin C supplier. About 0.04 grams of vitamin C are in 100 grams of the fruit. If you are not yet prepared for the sweet-sour taste in the early morning hours, simply spread a little sugar over the fruit. Because eating grapefruit food is well worth it! Spooning out a large half fruit will cover approximately 75% of the daily requirement. Oranges are not only delicious, but they are also suitable for preparing a fruity jam. Unfortunately, the one-to-one calculation with the vitamin-content of the fruit is tough to work out. Depending on the cooking time and heat, the vitamin losses are up to 100 per cent. But maybe getting vitamin C from orange marmalade is just an excuse for eating extra portions of bread with sweet spread or… Just grab yourself a clementine. With its handy size and easy peeling, the clementine is a super fruit for in-between meals. Thanks to 0.048 grams of vitamin C per 100 grams, you are also on the right track for covering your daily requirement. Two medium-sized or three smaller fruits are sufficient. The good thing is that you can take as much vitamin C as you want. What the body does not need is released. 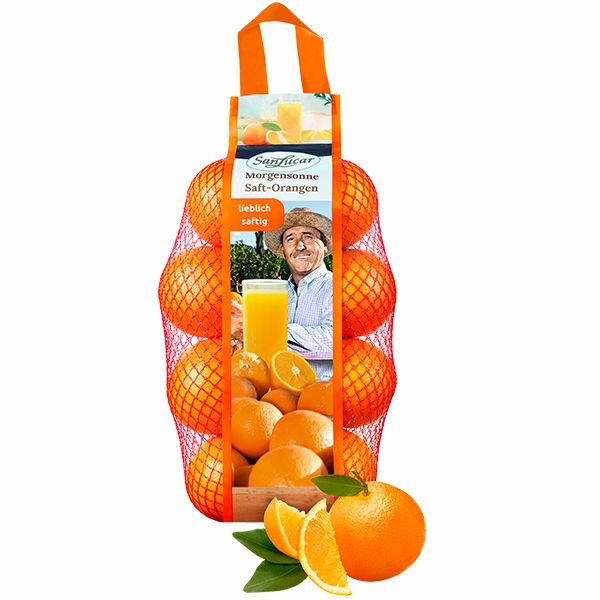 Instead of pure vitamin C, I brought my new knowledge about vitamins to my girlfriend – and a jute bag with SanLucar Clementines. Now I’ve have been spared of winter illness. So the hunt for vitamins definitely pays off.